Distilled alcoholic beverages that are labelled as "whisky" in India are commonly blends based on neutral spirits that are distilled from fermented molasses with only a small portion consisting of traditional malt whisky, usually about 10 to 12 percent. Outside India, such a drink would more likely be labelled a rum. According to the Scotch Whisky Association's 2013 annual report, unlike the European Union (EU), "there is no compulsory definition of whisky in India, and the Indian voluntary standard does not require whisky to be distilled from cereals or to be matured. Very little Indian 'whisky' qualifies as whisky in the EU owing to the use of molasses or neutral alcohol, limited maturation (if any) and the use of flavourings. Such spirits are, of course, considerably cheaper to produce than genuine whisky." Ninety percent of the whisky consumed in India is molasses-based, although whisky wholly distilled from malt and other grains, is also manufactured and sold. The drinking of Scotch whisky was introduced to India in the nineteenth century, during the British Raj. In the late 1820s, Edward Dyer moved from England to set up the first brewery in India at Kasauli. The brewery was soon shifted to nearby Solan (close to the British summer capital Shimla), as there was an abundant supply of fresh springwater there. The Kasauli Brewery site was converted to a distillery becoming India's first distillery, which is currently operated by Mohan Meakin. Production of alcohol from grain was hampered by shortage of extra grain, due to food shortages. 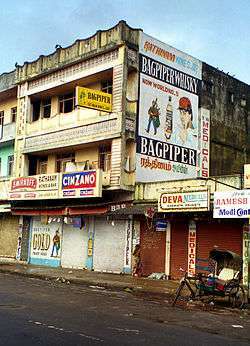 Allowing grains to be used for alcohol manufacture is an emotive subject in India, due to poverty and alcohol's ambivalent reputation. The manufacture of whisky from malted grains in India was pioneered by Amrut Distilleries. In 1982, Neelakanta Jagdale, Chairman and managing director of Amrut Distilleries, decided to create a premium whisky from a combination of malted and unmalted barley, while most distillers in India were manufacturing whisky by converting molasses to alcohol. Amrut Distilleries began procuring barley from farmers in Haryana, Punjab and Rajasthan, in addition to molasses, and launched Prestige Blended Malt Whisky in the Canteen Stores Department in 1986. The first batch of single malt whisky was ready within 18 months. Because India had no culture of consuming single malts at the time, the company did not consider bottling it as a single malt. Instead, the whisky was blended with alcohol distilled from sugarcane to produce MaQintosh Premium Whisky. According to Neelakanta Jagdale, "The alcoholic beverages industry was not a priority in the country. Although we received help to a certain extent from the Central Food Technological Research Institute (CFTRI), we had to find our own ways to learn about improved distilling methods". After liberalisation in the 1990s, import duties were reduced moderately, to about 35%, giving distillers access to better technology. Another factor was the entry of foreign players to the market, whose brands seen as more authentic and attractive by affluent Indian consumers. Indian distillers were forced to upgrade to keep up. This led several Indian manufacturers to acquire foreign liquor companies. Under Vijay Mallya's direction, the Indian company United Breweries acquired a number of noted whisky brands and distilleries in Scotland, including Dalmore, Isle of Jura, and Whyte & Mackay. United Breweries has been increasing production at its Scottish facilities, and has moved to double the production of whisky at Invergordon. Some of the Scotch whisky so produced is used to blend with the Indian molasses whisky. Amrut Distilleries launched Amrut, the first single malt whisky to be made in India, on 24 August 2004. The production of Amrut single malt whisky was the result of the distillery having malt that was ageing far in excess of what was needed for its medium range Prestige Malt Whisky. 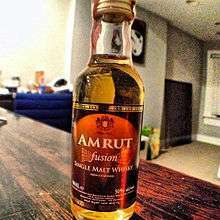 Initially, Amrut aged malt whisky for around a year before blending it. However, due to changing customer preferences, less malt whisky was being added into blended variants. Surinder Kumar, the master blender at Amrut Distilleries, has estimated that because of climate differences, one year of barrel ageing in India is equal to three years of ageing in Scotland. John Distilleries had been making blended whisky since its foundation, but decided to manufacture single malt whisky in 2008 in an attempt to enter the premium end of the market. John Distilleries chose to use Indian ingredients in the first bottling, to give the whisky characteristics of its country of origin. The first bottling of Paul John whisky, branded "Paul John Single Cask 161 Whisky", was officially launched on 4 October 2012. The brand's second release, also in 2012, was "Paul John Single Cask 163 Whisky". Following the single cask release, Paul John released two single malt whiskies in May 2013. They were branded Paul John Single Malt Whisky Brilliance and Paul John Single Malt Whisky Edited. In terms of volume, India is the biggest consumer of whisky in the world. It has a complex tax structure with taxes levelled by both Central and State Governments. Import taxes are applied by the Central Government on imported spirits. State level taxes are levied by each individual State, with taxation levels and methods varying significantly. The sale of alcohol is also prohibited in some States. Whisky accounts for nearly 60% of the Indian-made foreign liquor market. India accounted for nearly half the global whisky market by volume in 2010. The market is generally divided into segments based on price. The consumption of native distilled molasses-based whisky in India is encouraged by tariff barriers of up to 150% that impose a significant markup on imported whiskies in India. Imported Scotch whisky bottled under its own brand names makes up only 1% of the total market share. The substantial tax markup on imported whiskies has been categorised by the Scotch Whisky Association (SWA) as "pure protectionism". Indian distillers accuse the European Union of erecting its own sort of trade barriers by means of rules that forbid the marketing of molasses-based spirits as "whisky". Mallya has objected to the EU's refusal of entry to molasses-based whiskies, claiming that the "imposition of British imperialism is unacceptable". In a lawsuit brought in India by the SWA, the Delhi High Court in April 2006 enjoined Indian whisky manufacturers from labelling their product with the words "Scot" or "Scotch". However, on 27 May 2008, the Supreme Court ruled in favour of distiller Khoday India Limited, allowing the company to keep its Peter Scot whisky brand trademark. India is the world's fifth largest Scotch whisky market by volume (16.42 million litres of pure alcohol) and 19th largest by value (£61.59 million / ₹5321.0 million) as of 2012. 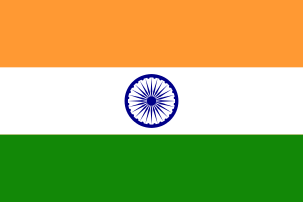 Following is a list of whisky producers in India in alphabetical order. The location of the company headquarters is given in brackets. The following manufacturers have ceased operations. ↑ "Where 'Whisky' Can Be Rum", from The Wall Street Journal, 26 August 2006, accessed 27 January 2012. ↑ Paul Peachey (3 March 2006). "Battle for the world's largest whisky market – India". South Africa Mail & Guardian. Archived from the original on 1 June 2008. Retrieved 14 May 2014. ↑ "Scotch whisky group threat legal action against Indian blends". The Economic Times. PTI. 12 May 2014. Retrieved 12 May 2014. ↑ "Europe cries foul on Indian whisky". Hindustan Times. PTI. 12 May 2014. Retrieved 12 May 2014. ↑ "Scotch whisky makers threaten action against Indian blends". Business Standard. PTI. 12 May 2014. Retrieved 12 May 2014. ↑ Official web site of Amrut Distilleries, accessed 25 June 2007. ↑ Whisky in India. Livemint (29 December 2011). Retrieved on 23 December 2013. 1 2 3 Indian liquor industry moves towards spirits made from authentic source materials – Economic Times. Articles.economictimes.indiatimes.com (16 March 2013). Retrieved on 23 December 2013. 1 2 3 4 "The malt of India". Business Standard. 18 February 2012. Retrieved 21 June 2013. ↑ Poornima Mohandas (5 March 2010). "Blend it like Amrut". Livemint. Retrieved 21 June 2013. 1 2 "High Spirits". Outlook. 18 February 2012. Retrieved 21 June 2013. ↑ Mahalingan, Kripa (18 February 2012). "High Spirits; Amrut Fusion is the only Indian brand to find global acceptance in the rarefied world of single malt whiskies". Outlook Business. Amrut Distilleries. Retrieved 21 June 2013. 1 2 "Bangalore's Amrut Distilleries high on success". Daily News and Analysis. Retrieved 21 June 2013. ↑ Ishani Duttagupta (29 April 2012). "How India's first single malt brand Amrut Distilleries cracked luxury market in West". The Economic Times. Retrieved 21 June 2013. ↑ Matt C (4 November 2012). "New release – Paul John Single Cask No. 161". Whiskyforeveryone.blogspot.in. Retrieved 4 July 2013. ↑ "Indian whisky in scotch's back yard". Drinks International. 5 October 2012. Retrieved 4 July 2013. ↑ "Top 10 Whiskies Reviewed in Whisky Advocate's Summer Issue". Whisky Advocate Blog. 13 May 2013. Retrieved 4 July 2013. ↑ Olly Wehring (15 May 2013). "Paul John Brilliance, Edited Indian whiskies". Just-drinks.com. Retrieved 4 July 2013. ↑ "Tasing Notes: Paul John Brilliance and Edited". Blog.thewhiskyexchange.com. 21 May 2013. Retrieved 4 July 2013. 1 2 "Indian Spirits Market". Credit Suisse. 27 September 2012. Retrieved 12 May 2014. ↑ Modi Illva plays smart in launching premium whisky, but Rockford Reserve faces challenges ahead – Economic Times. Articles.economictimes.indiatimes.com (10 February 2013). Retrieved on 23 December 2013. ↑ BBC News – Scotching the trade protection racket. Bbc.co.uk (19 January 2012). Retrieved on 23 December 2013. ↑ "If it's Indian it can't be Scotch, court tells India's whiskey makers", The Standard, 25 April 2006, accessed 28 June 2007. ↑ Dhananjay Mahapatra (28 May 2008). "Scotch or not, 'Peter Scot' won't be banned: SC". The Times of India. TNN. Retrieved 11 August 2013. ↑ Exchange Rate Average (British Pound, Indian Rupee). X-Rates. Retrieved on 23 December 2013. ↑ Scotch Whisky Association – Statistical Report 2012. Scotch-whisky.org.uk (9 September 2013). Retrieved on 23 December 2013.